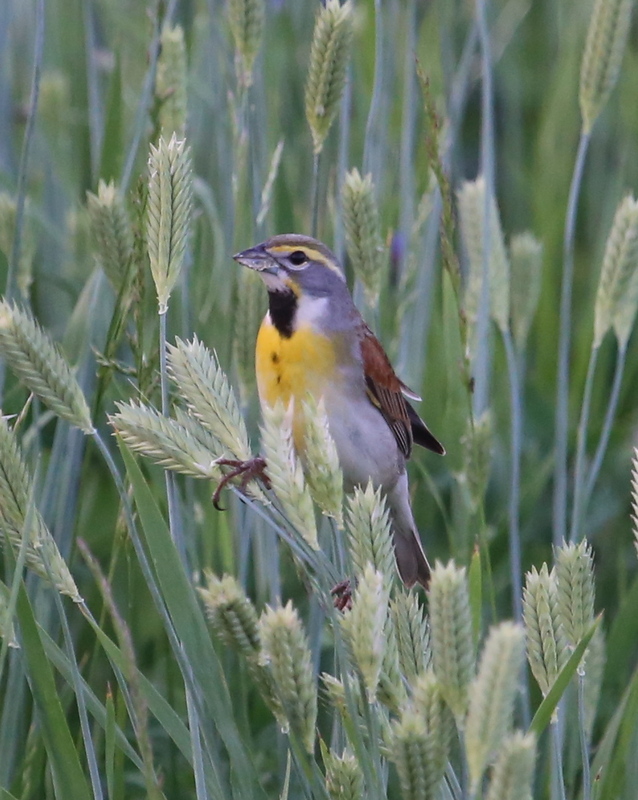 Forsyth Audubon’s 2014 Spring Trip was to North Carolina’s southern coastal region. Our “Base of Operations” was the Comfort Inn Shallotte where we enjoyed excellent hospitality – despite a few “technical difficulties” our first night. I would like to offer a special thanks to Judy Scurry for guiding us on our Saturday morning outing to Sunset Beach and for her dining recommendations. Judy, you made our trip very enjoyable and I am sure I speak for the rest of the group. Our group rounded out at 24 folks – a nice size for spring! Several different mini groups enjoyed an afternoon of birding on Friday in several different locations. Carol and Ouida win the “Most Unusual Sighting Award” when they were treated to a “Target Bird” flyover of three Woodstorks a few miles before reaching Shallotte! Friday Night’s restaurant of choice for a large part of the group was “Inlet View Seafood” in Shallotte. Judy recommended it and we were not disappointed. Osprey. Photo by Mike Conway. Saturday morning, we departed from the usual “Rob Early Start Time”, departing for Twin Lakes at 8:00 AM. 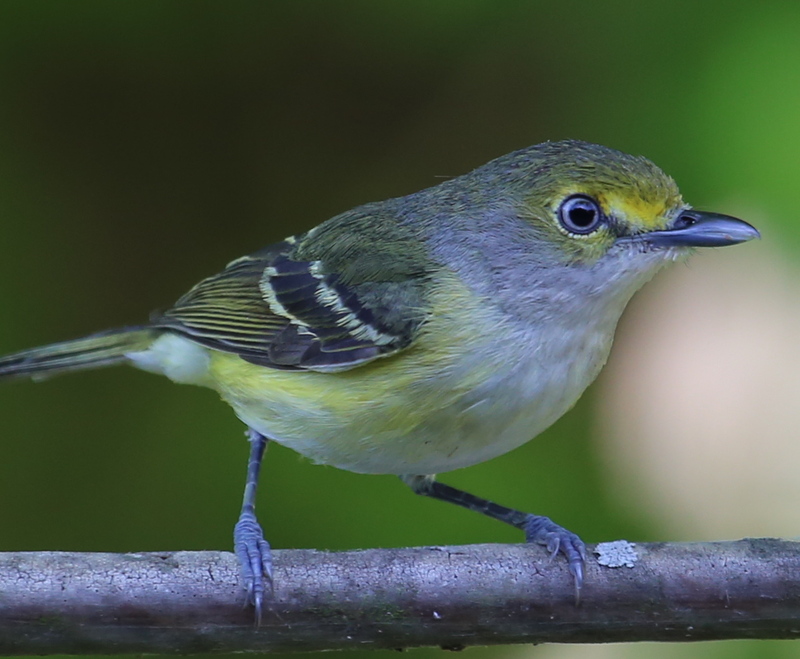 There we saw several of the expected denizens – egrets and herons – from the coast as well as a Common Moorhen, Alligators and Fox Squirrels the size of Welsh Corgis. 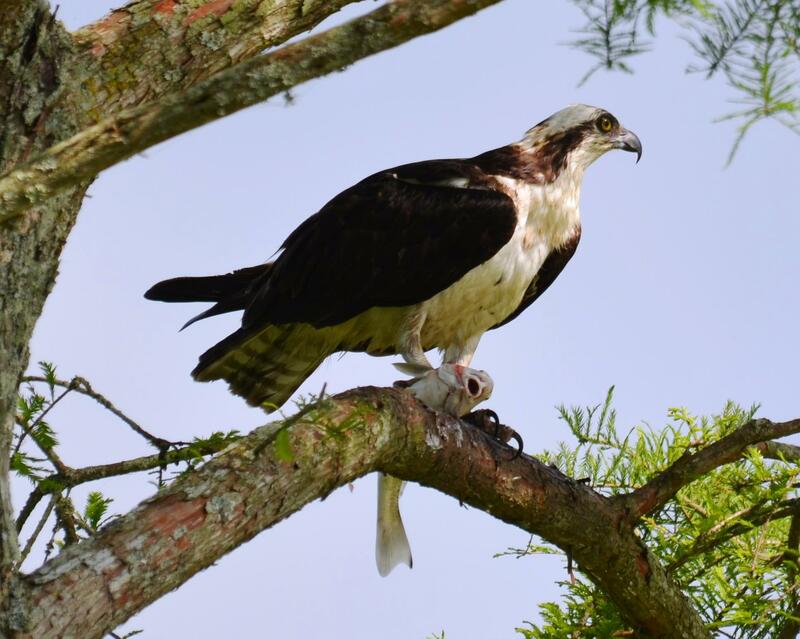 Ospreys were nesting in the tall pines and put on quite a show as did the Least Terns fishing quite successfully in the lake. We left the Lakes and drove to Twin Lakes Golf Course where Ospreys were nesting on platforms close to the parking lot. All were able to observe to their heart’s content. Especially interesting when one of the nesters showed up with a 10″ Whiting and proceeded to have breakfast in full view of the group. We left the golf course, navigated the roundabout and over the bridge to Sunset Beach. After a brief encounter with a Corn Snake, the best birding was on the inlet side of East Beach where we had excellent looks at Oystercatchers, Short-billed Dowitchers, Black Skimmers, Black-bellied Plovers and (a personal favorite) Red Knots. We had a quick look at the west end of the island and were delighted to have long looks at a Whimbrel. We left Sunset around noon and headed out to Oak Island. 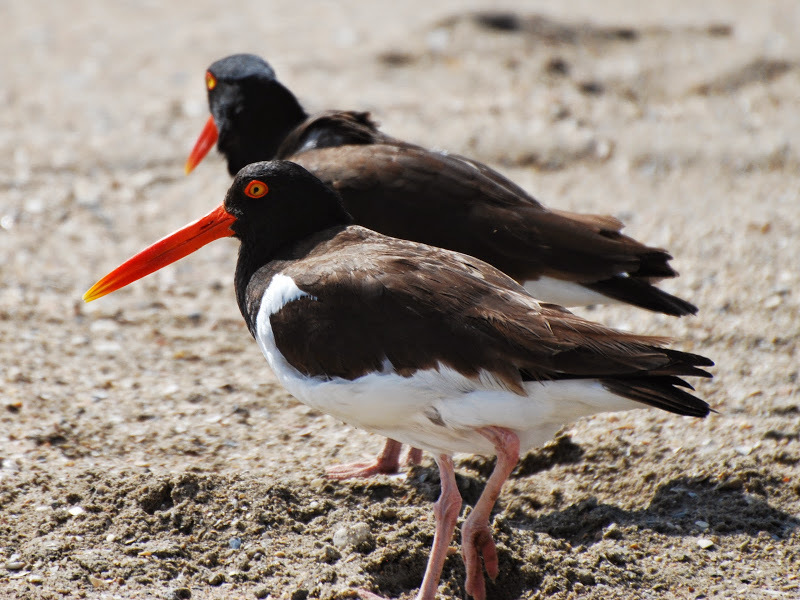 American Oystercatchers. Photo by Phil Dickinson. 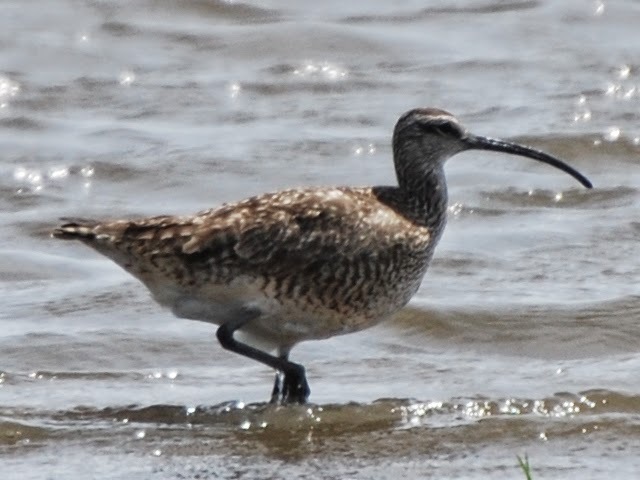 Whimbrel. Photo by Phil Dickinson. On Oak Island, we birded the 3 walkovers across the marshy area and though the species count was not high, what we saw was both interesting and entertaining. At the 30th Street Walkover, we had a Clapper Rail calling directly under and around the boardwalk. Several got decent looks at the moving grasses and the bird slinking along almost invisible in its camouflage. The 20th Street Walkover proved the old adage that everyone – er, everything – is attracted to a fight. Two Boat-tailed Grackles were battling on one of the creek banks – one on the other’s back, hammering him mercilessly on the back of the head. 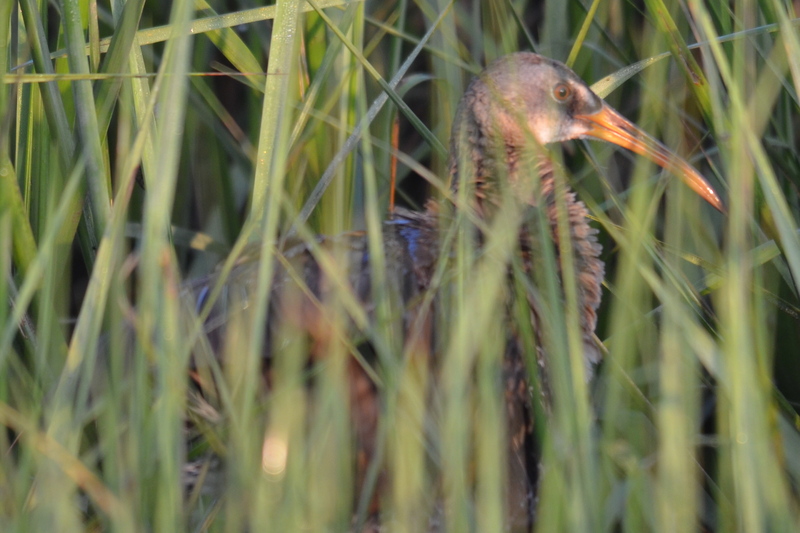 The loud squawking attracted a Clapper Rail’s attention from the opposite side of the creek. The Clapper was standing most unClapper like with head and neck extended so much that at first we thought it might be a Limpkin. The Clapper stood there for 5 minutes in rapt attention at the spectacle before him until the Grackles finally stopped the “Barney.” After checking the 3rd walkover, we headed back to the hotel to recount the day’s events. Clapper Rail. Photo by Mike Conway. Sunday morning, we got back to a more standard “Rob Early Start” with a 7:15 “AIS” time and headed for Holly Shelter Gamelands. Our timing was impeccable with Turkey season over on Saturday leaving the gates unlocked until Monday. We were able to drive in and avoid the 3 mile hike to Fussell’s recommended areas. 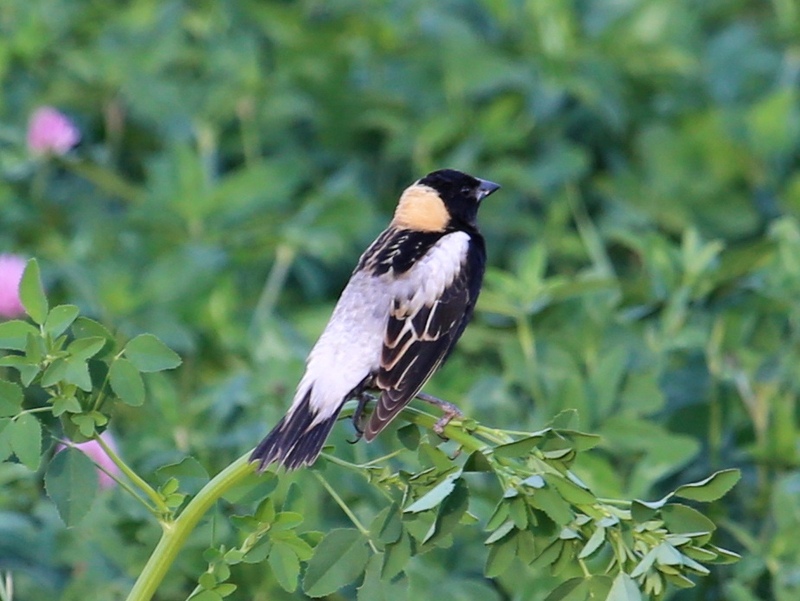 First stop, as we stepped out of our automobiles, we heard numerous Prairie Warblers, Common Yellowthroats, Yellow Warblers and the crowd pleasing Red-headed Woodpeckers and Bobwhites. Just when we turned to go back to the cars, two Red-cockaded Woodpeckers flew in and all got good looks at this declining species. 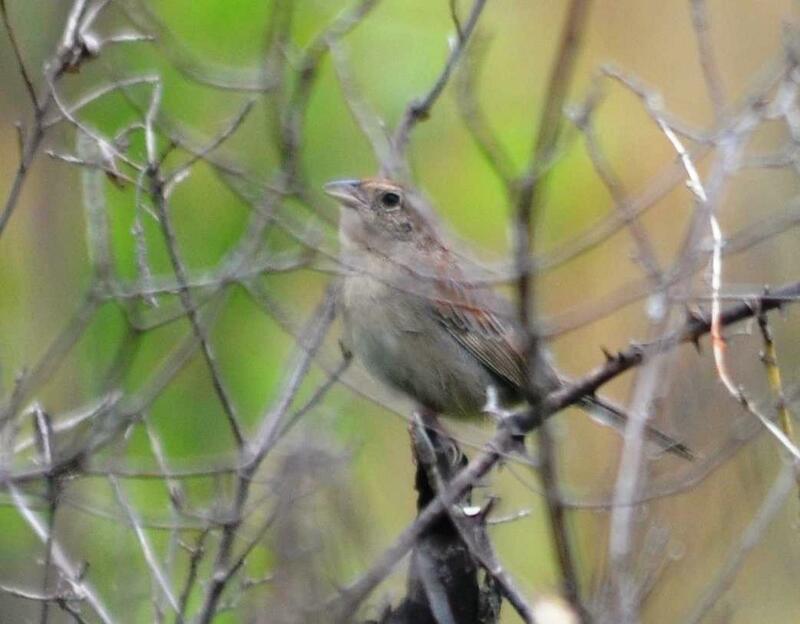 We drove to the second location and stopped to seek the Bachman’s Sparrow. We were directly in the area described by Fussell when we heard our first Bachman’s. 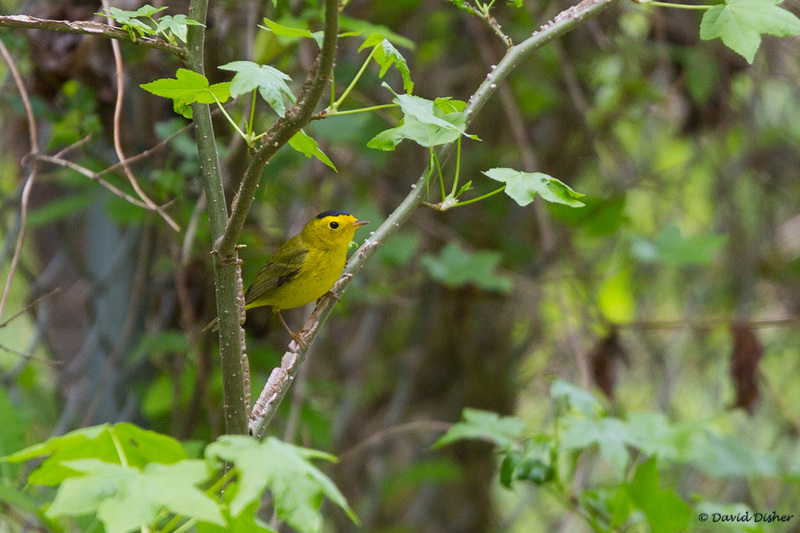 The group scanned deep into the brush in vain until we realized the bird was singing a mere 20 feet from the road. 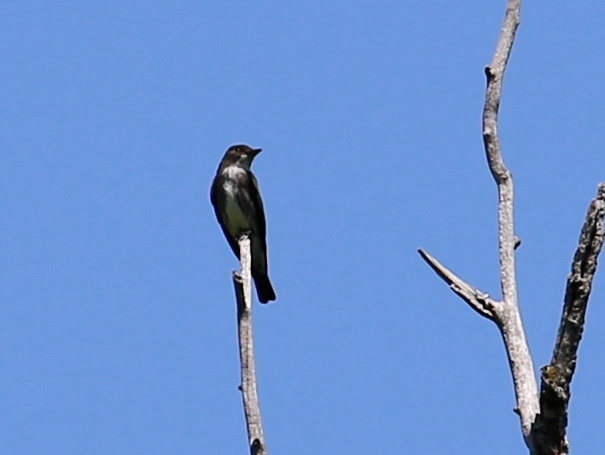 Everyone “got on” the bird as he sang away and it was a lifer for many in the group. One last stop series near the drain pipes and we saw a luckless, Legless Lizard that had just been hit by a car. Alas, he did not make it but still an interesting sighting. The last of the drain pipes had Swainson’s Warblers on either side of the road. Unfortunately, as is often the case with Swainson’s, the brush was so thick that despite the close proximity, no one got a look. Bachmans Sparrow. Photo by Mike Conway. Our species list stands at 94. In addition to the “Most Unusual Sighting Award” mentioned above, I would like to hand out the “Dr. Doolittle Award.” Although we enjoyed David Doolittle’s company, the award is not for him! No, the “Dr. Doolittle” award goes to Kitty Jensen for her ability to speak with female Boat-tailed Grackles. Kitty would not divulge the subject of her conversations but assured me that they were most enjoyable. The trip was a big success and I look forward to the next outing.